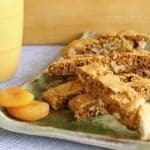 Apricots, ginger, walnuts all folded together in a crunchy Apricot Ginger Biscotti. Super treat and travel snack! Line two baking sheets with parchment paper or silicone baking sheet. In large bowl, stir together flour, cornmeal, sugar, baking powder, ginger, and salt. In a separate bowl, mix together the eggs, vanilla and almond extract. Slowly add flour mixture and beaten eggs, apricots, crystallized ginger and walnuts. Add the butter; mix together. The dough will be wet and crumbly. Knead with your hands to combine. Divide dough in half. Roll each portion into a 14-inch log, place on baking sheet. Bake for 30 minutes, or until set. Remove from oven and let cool for 10 minutes. Reduce the heat to 250 degrees F.
Transfer cookie log to cutting board. Using a sharp knife, slice into ½-inch cookies. Return the cookies to the baking sheet, and bake 20 more minutes. Remove for oven and allow to cool. Substitute dried cherries or figs for the apricots.